For the form of ice, see Aufeis. 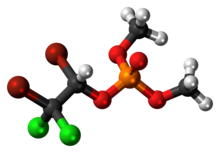 Naled (Dibrom) is an organophosphate insecticide. Its chemical name is dimethyl 1,2-dibromo-2,2-dichloroethylphosphate. Naled is stable in anhydrous condition and must be stored away from light. It must also be stored under normal pressure and temperatures. It degrades in the presence of water and alkali, and produces toxic chloride fumes if exposed to acids or acidic fumes. Contact with metals, reducing agents, or sulfhydryls cause naled to release bromide and revert to dichlorvos. Naled is used primarily to control adult mosquitos. It is also registered to control black flies, and leaf eating insects on a variety of fruits, vegetables, and nuts. Approximately 70% of naled in USA is used in mosquito control, and approximately 30% in agriculture. Naled has also been used in veterinary medicine to kill parasitic worms in dogs. It has been used extensively within the United States since the 1950s. Naled was used in New Orleans after Hurricane Katrina, in North Carolina after Hurricane Florence (2018), and has been used historically in Puerto Rico to control dengue. The Environmental Protection Agency has determined that exposure levels from eating crops treated with Naled are below the level of concern. With higher exposures, however, naled can cause cholinesterase inhibition in humans, which in turn can overstimulate the nervous system causing nausea, dizziness, confusion, and at very high exposures, respiratory paralysis and death. It has the UN hazard classification of 6.1 (inhalation hazard) and is prohibited for use as an insecticide within the EU. Naled may cross the placenta if it is in the bloodstream of a mammal. Repeated exposures may also cause future behavioral problems, as well as issues with neurodevelopment, growth, and respiratory health in offspring. Chronic exposure to dichlorvos, a metabolite of naled, has also been linked to neurological issues, such as Parkinson's disease and nigrostriatal dopaminergic degeneration. Persons who work closely with naled or other organophosphate pesticides should undergo regular testing of their cholinesterase levels. EPA classifies naled as Group E or non-carcinogenic for humans. Neither naled nor its metabolite, dichlorvos, build up in breast milk or breast tissue. Naled is considered highly toxic to bees, as well as being moderately to highly toxic to birds and toxic to most aquatic life. The mule deer is among those most resistant to its effects. Naled is banned in the European Union because of concerns about the toxicity. Aerial spraying of naled has been recommended by the Centers for Disease Control and Prevention and United States Environmental Protection Agency for the prevention of the spread of the Zika virus in the United States. Experts at both the CDC and EPA, as well as independent universities, have argued that naled is safer than other chemicals and should not cause significant health issues due to the low level of exposure. The federal government had considered using the chemical in Puerto Rico to stop the spread of Zika, but decided against it due to the potential danger to pregnant women. Its proposed use against Zika led to protests in Puerto Rico. Miami is using specialized trucks to spray naled and Bacillus thuringiensis israelensis (BTI). Governor Rick Scott said that the CDC recommended using helicopters to spray the insecticides, but some people in Miami and Miami Beach are opposed to aerial spraying. ^ a b c d e f g h i j k NIOSH Pocket Guide to Chemical Hazards. "#0225". National Institute for Occupational Safety and Health (NIOSH). ^ "Dimethyl-1,2-dibromo-2,2-dichlorethyl phosphate (Naled)". Immediately Dangerous to Life or Health Concentrations (IDLH). National Institute for Occupational Safety and Health (NIOSH). 4 December 2014. Retrieved 17 March 2015. ^ "Naled Facts". Pesticides Reregistration. Environmental Protection Agency. Archived from the original on 14 June 2012. Retrieved 16 November 2011. ^ a b c d e f "Naled". Extoxnet. Cornell University. Retrieved 16 November 2011. ^ a b c Naled Facts. (PDF) Environmental Protection Agency – USA. January 2002. ^ "Aerial Spraying for Mosquitos". Johnston County North Carolina. Johnston County Government. Retrieved 8 October 2018. ^ a b c d e f g "Zika Virus". 2014-11-05. Retrieved 2016-09-07. ^ "Naled for Mosquito Control". Environmental Protection Agency. 2016-07-05. ^ "Active substance non-approval/non-inclusion decisions – Biocides – HSE". www.hse.gov.uk. Bootle, England: Health and Safety Executive. ^ "CDC – NALED – International Chemical Safety Cards – NIOSH". www.cdc.gov. Atlanta, GA: Centers for Disease Control and Prevention. ^ a b c d "Miami Beach wary of spraying Zika chemical that can "essentially kill anything"". Retrieved 2016-09-07. ^ a b c Lee, Sharon; McLaughlin, Robert; Harnly, Martha; Gunier, Robert; Kreutzer, Richard (December 2002). "Community Exposures to Airborne Agricultural Pesticides in California: Ranking of Inhalation Risks". Environmental Health Perspectives. 110 (2): 1175–84. doi:10.1289/ehp.021101175. PMC 1241103. PMID 12460795. ^ a b "naled (Dibrom) Chemical Fact Sheet 6/83". pmep.cce.cornell.edu. Retrieved 2016-09-07. Naled degrades fairly rapidly with half-lifes of <=8 hours in soils and <=25 hours in aqueous solutions. Dichlorvos (DDVP), a metabolite of naled, is also rapidly degraded in soil with half-lifes of 2.3 - 8.0 hours. Naled exhibits low to intermediate mobility in soils, whereas dichlorvos is intermediately mobile to mobile. ^ BK, Binukumar; Bal, Amanjit; Kandimalla, Ramesh JL; Gill, Kiran Dip (2010-11-13). "Nigrostriatal neuronal death following chronic dichlorvos exposure: crosstalk between mitochondrial impairments, α synuclein aggregation, oxidative damage and behavioral changes". Molecular Brain. 3: 35. doi:10.1186/1756-6606-3-35 (inactive 2019-02-08). ISSN 1756-6606. PMC 2996378. PMID 21073741. ^ "Study links mosquito spray to delayed motor skills in babies". www.cnn.com. CNN. ^ a b c "'Like it's been nuked': Millions of bees dead after South Carolina sprays for Zika mosquitoes". Washington Post. Retrieved 2016-09-07. ^ a b c d Yuhas, Alan (2016-09-04). "US beekeepers fear for livelihoods as anti-Zika toxin kills 2.5m bees". The Guardian. ISSN 0261-3077. Retrieved 2016-09-07. ^ a b c "Florida to begin aerial spraying of insecticides to control Zika". Reuters. 2016-08-03. Retrieved 2016-09-07. ^ Barron-Lopez, Laura (2016-07-23). "The Feds Almost Used A Pesticide That's Harmful To Pregnant Women To Combat Zika In Puerto Rico". The Huffington Post. Retrieved 2016-09-07. ^ a b LaMotte, Sandee. "Zika spraying kills millions of honeybees". CNN. Retrieved 2016-09-07. This page was last edited on 26 March 2019, at 06:06 (UTC).